The barrier for sports headphones is simultaneously high and low. In one sense, any headphones will do — you can pick up a cheap Mpow set on Amazon and if you're not picky they should do the trick, at least until they break. Longevity is what separates good sport headphones from mediocre ones. Unless you're willing to keep spending money, you'll need sweatproofing to keep them from shorting out. 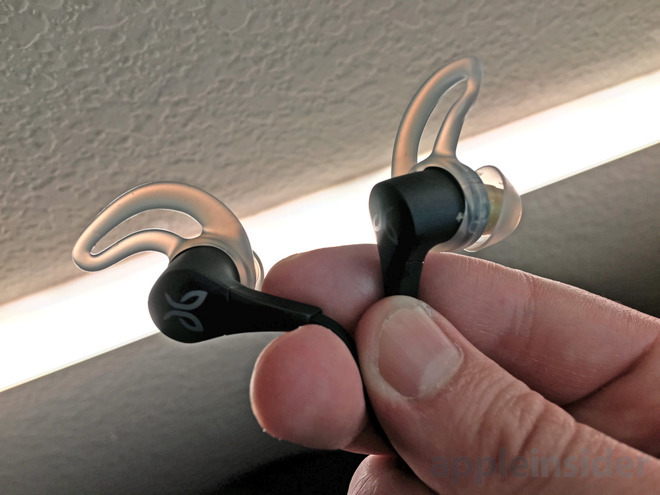 They should also fit securely and comfortably enough to last a complete workout, and sound good enough that you enjoy everything you're hearing, even in a loud gym. The X4 checks most or all of these boxes. On a basic level they're IPX7 waterproof — they'll protect against sweat and rain, in other words, just don't wear them in the shower or drop them in the pool. Ergonomics are always subjective with headphones, and the situation is no different here. 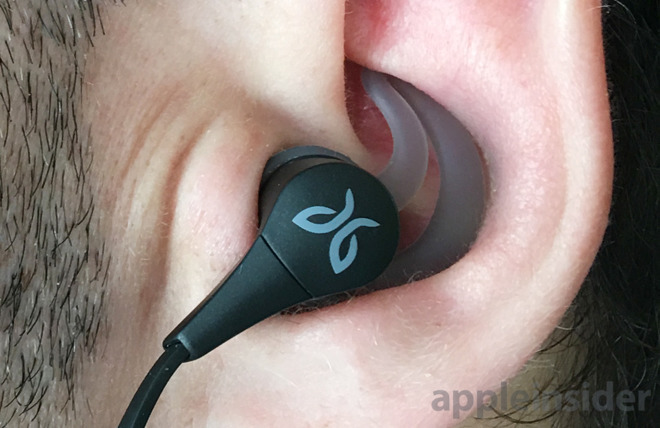 Jaybird relies on its signature fins to keep buds in place — in my case I found that except for occasional adjustments, they worked even during intense exercise. Three sizes are included in the box, of which we chose the biggest pair. Owners of previous X-series headphones will be glad to hear that Jaybird redesigned the fins for this generation, rounding them off while making them less flimsy. The result is both more comfortable and practical. Jaybird also includes a shirt clip, two sizes of silicone tips, and two sizes of Comply foam tips. I stuck with the default large silicone tips, but I highly recommend experimenting before you head off to the gym. A poor fit will be too loose and produce weaker isolation and bass. Sound quality is above average, with reasonably clear highs and mids, though bass addicts will probably prefer Beats. I say this having tested a wide variety of material, from ambient and podcasts to trance, thrash metal, and industrial. 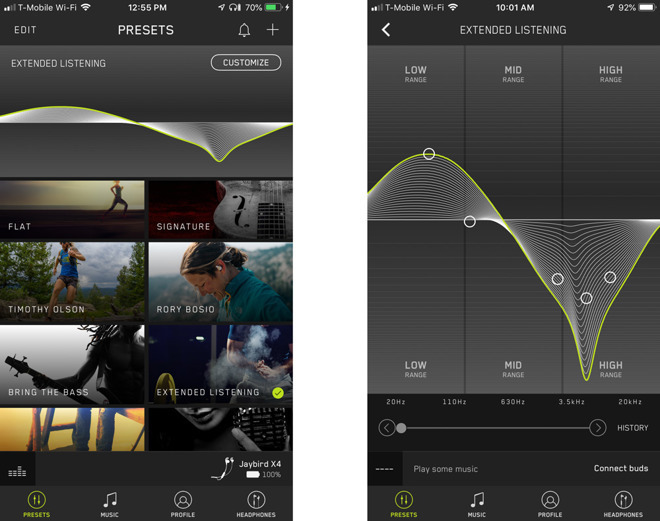 One of the benefits of going with Jaybird is that its MySound iPhone app can be used to tweak EQ settings on the fly. You can adjust them manually, or turn to presets created by Jaybird as well as athletes, musicians, and regular users. We mostly stuck with "Extended Listening," but some people might prefer settings like "Bring the Bass" or (yes, that's right) "Better Than Beats." There are relatively few downsides to the X4, all told. One is that you essentially have to adjust the EQ, since the headphones are tuned to be flat by default. You can also only pair with one Bluetooth device at a time, which is inconvenient if you expect to alternate between your iPhone and a wearable. If you skip pairing with your phone, there's no way to tweak the EQ from a device like an Apple Watch. We're also not a fan of Jaybird's proprietary charger, and eight hours of battery life is a potential downside. People with regular fitness routines will want to charge at least once a week, and likely more often than that if they're into activities like hiking, bodybuilding, or long-distance running. If I'm honest, I expect to go back to my Powerbeats3 partly because I do prefer the extra bass, but mostly because I find hooks to be more reliable for keeping things in place. Fins can help stop buds from falling out — hooks guarantee it. Unless those caveats apply to you too however, it's hard to beat what the X4 offers for the price. They're an evolution of an already winning formula. The Jaybird X4 wireless sport headphones retail for $129.99 and are available at Amazon and Best Buy with free shipping.